We are not only distributors of Wendals Herbs but also users and believers in the benefits of the herbs. These herbs are formulated in Europe especially for horses and were extensively tested before release,unless otherwise indicated on the label, they all will pass drug screening as they contain no prohibited substances. 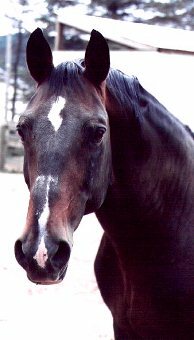 Give your horses that extra help they may need for health, energy and attitude, feed Wendals Herbs. As this page develops we will be showing you photos of horses that are using different herbal preparations and why. We will also be explain how and why it works and the benefits we have seen and document on our horses, boarders horses and what other users have seen in their horses. 1. Old Timer: Inselkönig was on this and it helped his old age problems! Until his death he moved like he did in is mid 20's. 2. Moody Mare, we use this on one of the broodmares who is very protective of her foals, this along with Special Calmer has helped us with our handling of the foal by making her much more mellow. We have also used special calmer on horses in stressful situations with excellent results. Another friend used Special Calmer on a hyper arab gelding with excellent results. 3. Easy Mover, we have used this to help our's and other's horses recover from various muscle and tendon injuries, with great results. It also works well on horses with joint problems and arthritis. 4. Garlic, used for fly and insect repelling, and it works great! 5. Herbal Lick, we give this to our stallions. 6. Special Easy Mover, we had given this to Inselkönig in the past for his old age joint problems. It worked very well, but Old Timer combines these ingredients and other ingredients for more complete older horse benefits. 8. Respiration - works well on horses with Asthma and other respritory allergies. Promotes freer, easier breathing. One of our boarders uses this and it has worked wonders on her gelding. 9. Devils Claw(a liquid) - natural anti-inflamatory. We use it in place of bute. Wendal's Herbal preparations are special blends of live lactic various herbs that are formulated for specific needs of horses. They are each unique combinations that supply valuable nutritional materials to, depending on the preparation, promote healing, reduce inflamation, and promote a better attitude. All these products have been developed specifically for use by horses and tested extensively on horses, including breeding stock.